Is China leading the blockchain innovation race? 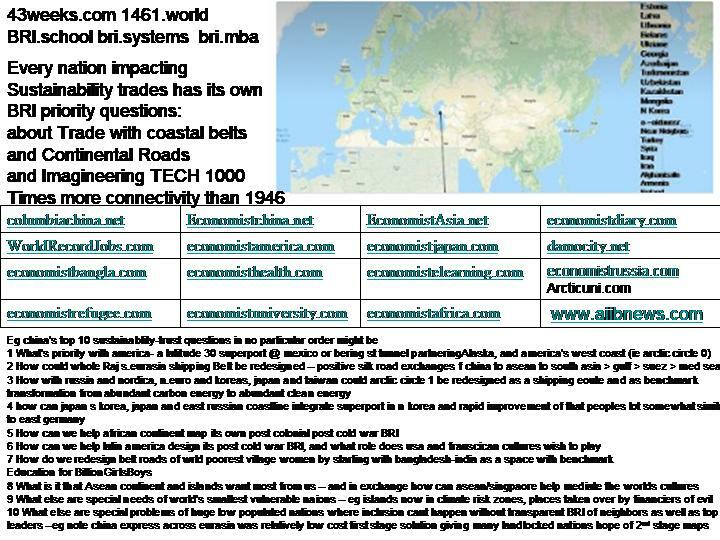 Around 1500 the human race needed new trading maps as awareness grew that the world was round. Since 1946 our human race has spent 1000 times more on communications technologies. This Entrepreneurial Revolution make new mapping essential for every enterprising person -and every mentor of childrens futures - not just for infrastructure experts and public utilities. Moreover infrastructure mapping grounds two more innovation revolutions critical to 21st C life: Green and Digital value multipliers only improve the human lot when designed into distributed and people-centric economic models. This requires an opposite maths from the carbon-energised age of big growing bigger. 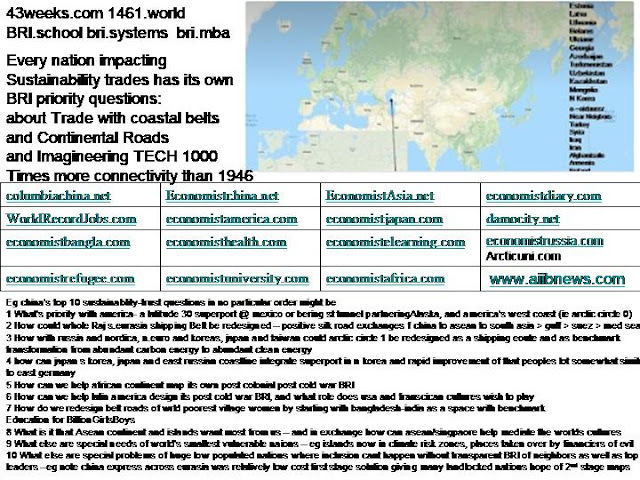 Understand that countries that under invest in belts lose border-ability to celebrate each others cultures/languages and miss parallel opportunity to upgrade green pipelines. Regions with landlocked countries with no shared superport lose out on high value trades. Lack of attention to belt roads multiplies both rural and minority exclusion. Non-Sustainable World’s Biggest Maths Errors – how come? Jan 17, 2017 - The following is the full text of Chinese President Xi Jinping's keynote speech at the World Economic Forum in Davos, Switzerland:. Jan 19, 2017 - Chinese President Xi Jinping delivers a keynote speech at the United Nations Office inGeneva, Switzerland, Jan. 18, 2017. (Xinhua/Rao Aimin). New Development Bank (NDB) is issuing its first green bond worth three billion RMB in the Chinese inter-bank bond market. How can Chinese SOEs and private investors co-invest? 3.5 billion global youth (under 30's) humanity's greatest resource and China which is open sourcing the greatest jobs education and sustainable collaborations worldworldwide. THANKS! by ending middle men and valuing new order of transparency in smart contracts and Global village ledgers . In addition to inclusion of Fintech, why not healthtech, philanthropy tech, educationtech …? valuetrue.com 9500 investors in millenials = most connected educated collaborative to grace planet,; Knowledge Collaboration City London,; valuetrue.com. If you are alive and learning today, you are part of the historic human race that spent 4000 times more money and time on worldwide communications than ever before. ....Ask yourself which markets does your knowhow participate in, or collaboratively search out joyful goodwill around. 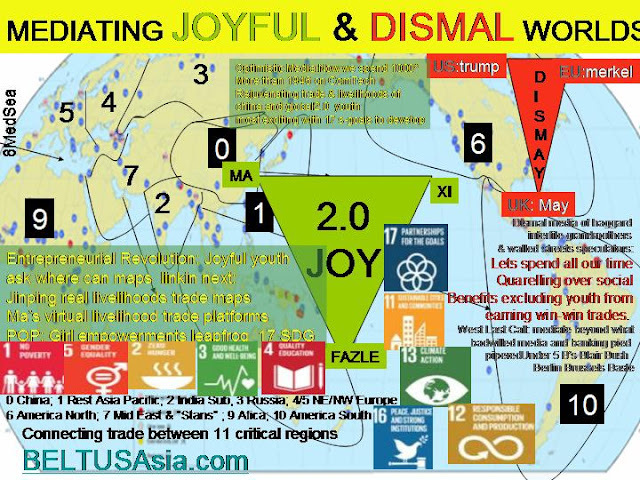 SO how purposefully do these markets' reality map the most sustainable impacts you and yours (including virtual networks and real communities) celebrate for future generations.? Take fashion garments for example. We worldwide citizens could be proud that the world's poorest nation in 1972 is now the second greatest exporter. With Women4Empowerment, we could be celebrating how the people who produce these garments have predominantly been mothered by village women who were illiterate and suffering from having none of the infrastructure benefits ( electricity grids, running water, communications) that other places had gained from the industrial revolution. But then we in 2015, we cannot close our eyes to the reality that we still live in a world where 2 years ago over 1000 such brilliant young women were killed by a factory collapse. In other words the fashion markets shames us all starting with those it beautifies the most (fashion4development.com seeks to put this right at the start of each new UN year including september 2015's which the UN has stated as needing to be the most transformative in its existence if sustainability goals are to be empowered by millennials). Today's future began in 1946: our human race started doubling these borderless spends every 7 years. 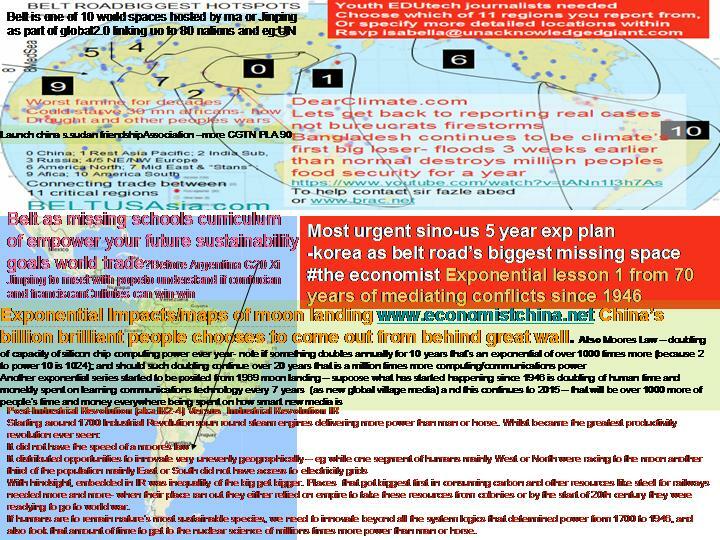 By 2030, livelihoods ( and our species futures to be or not to be) will have exponentiailly linkedin 12 doublings (4096 value multipliers)- this entrepreneurails revolution has been mapped out of The Economist in 1972, IT WILL BE 10 times more exponentially impactful up or down than industrial revolution. Mar 20, 2012 - The country's task force for poverty alleviation Monday updated a list of 592 keycounties in the national program to reduce poverty, which are expected to receive billions of yuan in fiscal support from the government. Mar 13, 2015 - Liu was quoted as saying. China has 592 counties that are officially designated as poorand 14 contiguous poor areas. 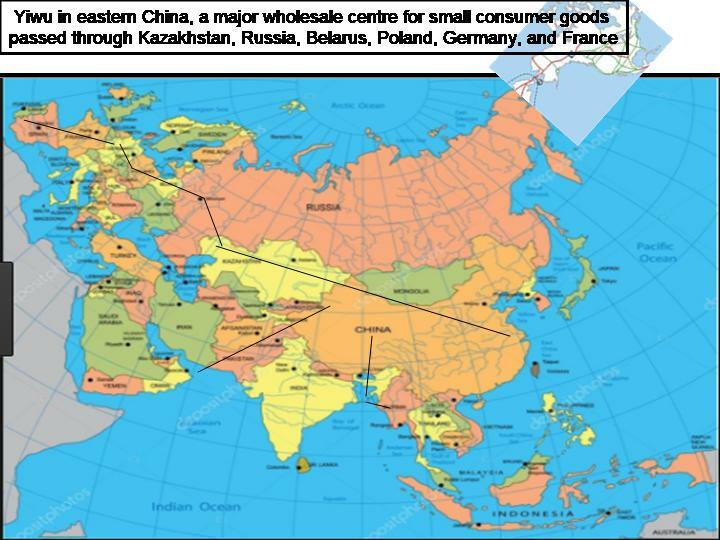 The two categories had some overlap and covered a total of 832 ofChina's counties, he said. Apr 8, 2015 - That's because Xinshao now receives an extra 560 million yuan ($90 million) a year from Beijing, as the Economist points out in a recent story. The Chinese government funnels billions of yuan a year to 592 counties and 128,000 villages that compete to be officially recognized as poor. BEIJING, Feb. 25 (Xinhua) -- Chinese president Xi Jinping has reiterated "core socialist values," urging deep understanding and comprehensive implementation of the moral doctrine nationwide. While presiding over a high-level meeting on this issue on Monday, Xi asked for widespread publicity of the values, which he called the "moral and ideological foundation" for socialist China, through all society to guide morality. Xi said authorities should make use of various opportunities and occasions to create circumstances for the value's cultivation, and "make them all-pervasive, just like the air." Core socialist values comprise a set of moral principles summarized by central authorities as prosperity, democracy, civility, harmony, freedom, equality, justice, the rule of law, patriotism, dedication, integrity and friendship. This doctrine has been encouraged by the Communist Party of China (CPC) since its 18th Party Congress in late 2012. It has evolved into a national campaign to rebuild faith amid concerns that the world's second-largest economy has lost its moral compass during its three-decade economic miracle. Last week, Xi called for greater efforts to set up a socialist value system with Chinese characteristics in line with a new era while addressing a meeting of ministerial-level officials. Cultivating and acting on core socialist values is an important way of ensuring smooth operation of social systems and safeguarding social order, according to the president. He urged implementation of the values in every aspect of life and for the doctrine to be made a "spiritual pursuit" of the public. The principles should be introduced into text books, classes and schools and should be demonstrated in various cultural and art works, according to Xi. "Core socialist values are the soul of cultural soft power," Xi said. "Basically, the soft power of a nation depends on the vitality, cohesive force and charisma of its core values." Officials and CPC members were told to take the lead in following the principles and acting as role models in practising morality. Media are also asked to spread moral righteousness, a call to which TV stations across China are already responding. All policies regarding the economy, politics, culture and society must be worked out to benefit the cultivation of core socialist values, and the law should also promoting their building, Xi said. Behavior complying with the values should be encouraged and violations of them must be restrained, he added. The president also stressed that their implementation must be based on traditional Chinese culture, which he labelled the root of the values.